By the time the four 12-year-old girls' parents released a letter last Friday detailing the events that transpired at East Middle School in Binghamton, New York, word had already spread to an enraged community. How in the world did school administrators get away with strip-searching the girls to search for drugs, merely because the girls' behavior seemed "hyper and giddy"? For many, it seemed like a shocking violation of the girls' privacy and a gross overreaction from school administrators that was based solely on their perception of the "'strangely immature" behavior of teenage girls. No drugs were uncovered during the "search," and three of girls were eventually sent back to class. The fourth girl, who refused to remove her clothes, was sent to in-school detention for refusing the strip search. If the children's allegations are to be believed, their experience sounds more likely to have occurred in a jail than in a school. Yet, increasingly, all around the country, schools are criminalizing behavior that was once deemed merely, well, childish. In 2012, another case became infamous in the local media: School administrators in Georgia called local police on 6-year-old Salecia Johnson, who was having a temper tantrum. The police actually came and handcuffed the little girl, eventually charging her with battery of a schoolteacher and criminal damage to property. In 2015, a viral video emerged showing a school resource officer in South Carolina body-slamming a young female student. The student had allegedly ignored the teacher's instructions to turn off her cellphone or go to the principal's office. The officer who responded to the teacher's request to remove the student was eventually fired, but the case itself began a series of efforts scrutinizing what many see as the unfair criminalization of African-American children in the public school system. The American Civil Liberties Union and other civil rights organizations are now challenging what they consider to be "a disturbing national trend wherein children are funneled out of public schools and into the juvenile and criminal justice systems" -- a prison pipeline. Many of these children are amongst the most vulnerable, suffering from learning disabilities, impoverished living conditions, unstable family situations, as well as abuse and neglect. It is these very students who are presenting the behavioral problems. The school system is, in many cases, ill-equipped to deal with these students' special needs, and as a result, these students end up isolated, punished and, in many cases, expelled from the system entirely. The zero tolerance disciplinary regimes upheld by many school systems reflect the strained resources with which public schools are faced. Often, teachers have to deal with incredibly large class sizes (35 or more students per classroom) and, as a result, have difficulty maintaining order and discipline while teaching rigid curricula in line with local, state and federal achievement standards. With some social problems, including linguistic and immigration-related challenges, schools need additional resources: bilingual staff, school psychologists and social workers. These are often in woefully short supply in a school system that is already under-resourced. Often, the only adults available to deal with troubled students are the school security guards and resource officers, who usually have one solution: impose disciplinary measures, including arresting children who misbehave and charging them with actual crimes. What seems to be obvious is that African-Americans and other students of color are especially vulnerable to push-out trends and the discriminatory application of discipline. Nationally, blacks account for about 16 percent of students in public schools and are subjected to 31 percent of school disciplinary actions that result in suspension, arrest or expulsion. What is also shockingly clear is that students who have been expelled from school are nearly three times more likely to become involved in the criminal justice system within a year of expulsion. High school dropouts are, in fact, 63 times more likely than college graduates to be incarcerated during their lifetimes. 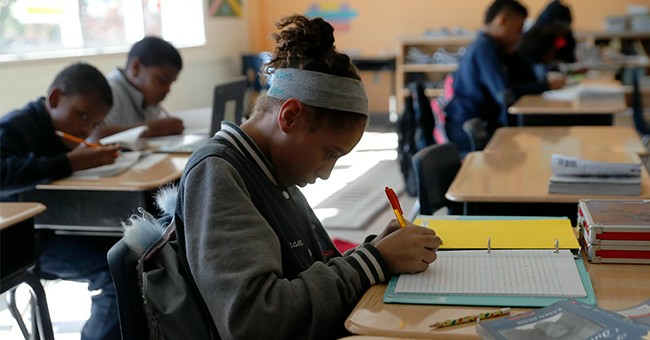 The so-called "school-to-prison pipeline" has become such an obvious trend that states have commissioned prison-construction projects based on the number of children who fail third-grade reading. Failing reading is, in fact, a major indicator of subsequent behavioral problems that often result in student expulsion. A 2012 newsletter published by the Nevada Department of Corrections seems to confirm this trend, stating: "So many nonreaders wind up in jail that officials have found they can use the rate of illiteracy to help calculate future prison needs. Indiana's former governor has stated that determining the number of new prisons to build is based, in part, on the number of second graders not reading at second-grade level. In California they plan how many jail cells they will build in the future by how many children are not reading on grade level by third grade." Education is critical for all children, but especially African-American children, who come from challenging socioeconomic backgrounds at a far higher incidence than other groups. A myriad of solutions to the school-to-prison pipeline have been proposed, including increasing the number of black male teachers in the public school system. The difficult issue seems to be this: In a society that, in many cases, instills antisocial behavioral traits in black children as street survival mechanisms, schools, which only have students during the day for five days a week, may be ill-suited to counteract the massive outside social influence. In that light, the prison pipeline starts well before the children arrive at school. It starts on the way to school and at home.